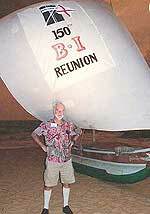 The International Reunion to celebrate the 150th Anniversary of BI took place at Mt. 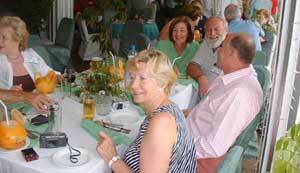 Lavinia Hotel in Sri Lanka during the first week of May 2006 and was a great success. The reunion was attended by 140 including wives/partners. It covered 7 days and there were 4 formal functions during that period. It was organised by a committee consisting of Graham Goodanew (Hotel and Events) Tony Gates and Warwick Harwood (Bookings, Administrations and Events) ably assisted by James Slater, Nick Edwards, Mark Kenyon and Martin Speller. celebrations, with all rooms having extensive sea and beach views. The food was of a very high standard. The local Three Coins Beer was a tasty drop, as was the Nimbu (Lime) Pani served from the various bars. 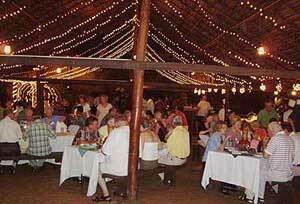 There were three main restaurants, The Governor's Room (air conditioned), The Terrace Restaurant and, on the beach, The Seafood Cove. All providing excellent food. Although several members came to Mt. Lavinia early, the bulk started arriving from 30th April. Members soon found their friends and disappeared to the various bars, to catch up. The first of the formal functions was the Welcome cocktail party, held on the Tuesday evening (2nd May) on a large balcony facing seaward. The hors d'oeuvres were tasty and plentiful, and a light meal was also unexpectedly provided courtesy of the Hotel. The BBQ was held the following night at the Hotel's private Beach Bar. A dinghy was rigged on the beach, with the sail carrying the BI funnel, house flag and 150th. Reunion. During a very good meal, there was a colourful fireworks display which was further enhanced by a short sharp electrical thunderstorm. However we were sheltered from the elements and it all added to the evening. There being no formal functions on the Thursday or Saturday, various tours were organised to Kandy, Pinnewela, Botanical Gardens, Nuwara Eliya (Neuralia) and Galle. Others visited Colombo for shopping and checking out the GOH and Galle Face Hotel. 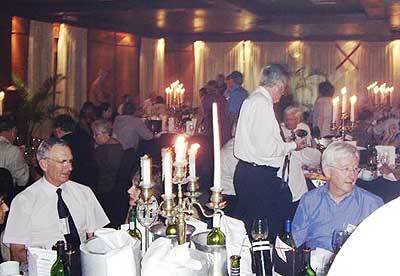 The Reunion Dinner was held in the Regency Room on the Friday night. The tables were decorated with centre pieces consisting of a hull and BI funnel with two small BI flags. We met on the balcony of the restaurant at 1830 hrs, for pre-dinner drinks before taking our seats in the dining room. Warwick Harwood read the Cadets' Lament and then proposed the Loyal Toast. James Slater briefly recorded the names of those members who had cancelled their trip due to ill health or circumstances beyond their control and, in the case of Roger Dunn, who had recently crossed the bar, he then proposed a Toast to those who had "Crossed the Bar and Absent Friends". Anne Gates (nee Waddell) said Grace and we were then served a superb dinner, beautifully presented by the hotel staff. Following the dinner, Chris Hare presented Ian Marr's Ode To The BI. David Mitchell followed with a brief and light-hearted review of the Company's history and then proposed the toast to the BI. It was, all in all, an impressive and very enjoyable evening. Final event: the curry lunch. The reunion was not all about eating but the food was excellent! Certainly a memorable week, with warm weather, and as predicted, not a monsoon cloud in sight, excellent food, cold drinks, and fine service at Mt. Lavinia. Hotel. However, the main purpose of getting together was to catch up with old friends/shipmates and making new friends amongst 'the old'. This we achieved in a great setting.